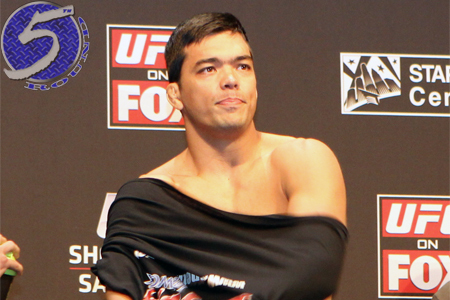 UFC president Dana White appeared as a guest on Fox Sports Live Wednesday and cleared (or muddled) the air regarding the stakes for Lyoto Machida (pictured) in this month’s pivotal fight against Gegard Mousasi. Win, and you might score a middleweight title shot. Connecting the dots, White’s basically saying a highlight reel finish will catapult Machida to the front of the line. Although, timing, injuries and what the other 185-pounders do in their upcoming fights could play a significant role from there. So, “The Dragon” was essentially promised nothing. “The thing that makes this 185-pound division so interesting and so exciting right now is – obviously Chris Weidman looked unbelievable in his two fights against Anderson Silva and is the new champ – who you’ve got waiting in the wings now. You’ve got Vitor Belfort next, you have [Ronaldo] ‘Jacare’ Souza, you have Lyoto Machida, and the list goes on and on of all these nasty, nasty guys at 185 pounds,” White said with his promoter’s cap firmly affixed. Machida battles Mousasi February 15 Arena Jaragua in Jaragua do Sul, Brazil. Nobody knows exactly what is on the line, but – a devastating finish is good, an uneventful decision win is bad and a defeat would be disastrous.